Introduction to Encaustic: 5-6 hour workshop for groups of 2- 4 persons. $150 per person, all supplies included. Techniques covered in this class will include prep, layering, incising with pigment stick/wax inlays, collage, safety, studio setup and more. You will take home a a practice sheet on watercolor paper with all the techniques to refer to and a completed 6x6" artwork on cradled panel. Painting: 2 day workshop for groups of 2-4 persons, all supplies included. $300 per person. You will take home (1) completed 12x12" cradled panel and several Arches oil paper works. Advanced private instruction in encaustic or cold wax/oil $35 per hour, plus materials fee. Travel for workshops is possible. Please email me for more information. Enjoy learning these exciting mediums in a studio located in St. Augustine, Fl. Instructor, Teri Siewert, has been trained at R&F studios in Kingston, NY (http://www.rfpaints.com/) in advanced encaustic teaching techniques and studied with several well known artists in the field of encaustic and cold wax/oil mediums. 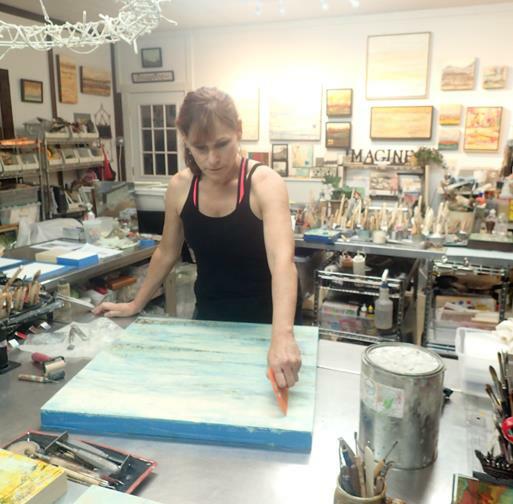 She is also a recipient of the 2015 scholarship to the Encaustic Conference in Provincetown, and a full-time artist in both mediums for the past eight years. You will receive the most comprehensive information available and be ready to develop your own personal style!